It was a spring evening in Washington DC; a chilly autumn morning in Melbourne; it was exactly 22.00 Greenwich Mean Time when a worm entered the computerised control systems of hundreds of Australian prisons and released the locks in many places of incarceration, some of which the hacker could not have known existed. Because Australian prison security was, in the year 2010, mostly designed and sold by American corporations the worm immediately infected 117 US federal correctional facilities, 1,700 prisons, and over 3,000 county jails. Wherever it went, it travelled underground, in darkness, like a bushfire burning in the roots of trees. Reaching its destinations it announced itself: THE CORPORATION IS UNDER OUR CONTROL. THE ANGEL DECLARES YOU FREE.’ Has a young Australian woman declared cyber war on the United States? Or was her Angel Worm intended only to open the prison doors of those unfortunates detained by Australia’s harsh immigration policies? Did America suffer collateral damage? Is she innocent? Can she be saved? Several readers didn’t like many of the characters and found it difficult to continue reading. However the premise of the book was good. One reader enjoyed the political aspects and the commentary of what we remember, plus forget by personal choice. The concepts were interesting but the book wasn’t well executed. Some characters were interesting particually Woody but mostly they didn’t gain the reader’s sympathy. The book was confusing to follow and ended in an anticlimax. Not one of Peter Carey’s better books. It could have had a great impact. Most wouldn’t recommend it to others. 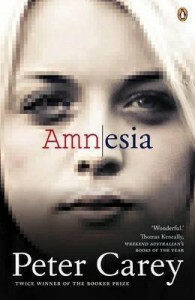 This entry was posted in Australian Authors, Book Reviews, Fiction and tagged Amnesia, First Wednesday Book Group, Parramatta City Library, Peter Carey by admin. Bookmark the permalink.